It's a brand new year! What better time to start a new daily devotional. Unto The Hills is 365 daily devotions written by evangelist Billy Graham. Originally published in 1986, the words still ring true today. Each passage which is about a page long and includes a Bible verse and a prayer for the day. Billy Graham is a very respected man who is known all over the world. He is a great speaker and author as well. 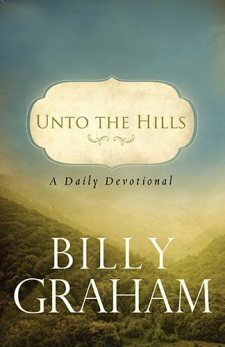 In Unto The Hills Reverend Graham reminds us that God will let us see a view form the mountains or hills. He does this only so we'll be refreshed enough to go back to the valleys where we can work and serve him. I am really enjoying reading these daily devotions. They may be short, but they are full of wisdom and inspiration. I think this would be great way for anyone to start their day. Pick it up, I know you won't regret reading it! I received Unto The Hills from Book Sneeze in exchange for this review. Sounds great. I got to see Billy Graham in New York five years ago. It's a memorable experience to see someone in person after hearing them on television. I really like Billy Graham and I love love love being in the mountains and hills near our home.